NEW HAVEN, Conn. — On June 4, while the Bush administration twisted arms in Congress to pass an exploitative guest worker program, New Haven became the first city in the country to issue a municipal ID card regardless of immigration status, which can be used for city services and banking. Within 36 hours, in the early morning, without informing the mayor or police, ICE agents forced their way into numerous homes in the city’s Fair Haven neighborhood, taking 32 people away from their families in handcuffs. Only five had deportation orders. DeStefano called upon Michael Chertoff, the secretary of homeland security, to put a moratorium on raids until a full investigation is held. Rep. Rosa DeLauro and Senators Chris Dodd and Joseph Lieberman jointly signed a similar letter. “We won’t stand for the violation of constitutional rights and racial profiling in New Haven,” said DeStefano. The mayor’s response was part of a virtual uprising of the city with unions, churches, community organizations and elected officials participating in press conferences, rallies, church services and outreach to immigrant families. This impacted ICE, whose field office director told the New Haven Register June 13 there are no plans to return to the New Haven area in the near future. The driving force in the city’s solidarity with immigrant workers was Unidad Latina en Accion, a grassroots immigrant organization working with Junta for Progressive Action. ULA requested the municipal ID cards four years ago, after the state Legislature failed to agree that driver’s licenses be issued regardless of immigration status. Right-wing anti-immigrant activists came into New Haven to oppose the ID program. They sought to divide African Americans from the immigrant community by leafleting African American churches and threatening members of the majority African American and Latino Board of Aldermen. Speaking before the vote, Alderman Yusuf Shah likened this attack on immigrants to the attack on Black families he experienced as a youth in New York when his family moved into a new neighborhood. The measure passed 25-1. Celebrations of the victory were cut short by the raids. Instead, the community came together to aid and assist the immigrant families affected. Junta and ULA collected affidavits, opened a food pantry for the families, and distributed “know your rights” information. The Yale Law School and American Civil Liberties Union committed legal resources to the victims, and plan to challenge the raid’s legality. Labor unions began raising bond money and mobilizing their members. Catholic and Evangelical churches met with the families. St. Rose de Lima church in Fair Haven held a special mass for its largely immigrant membership and allies. The detainees were scheduled for a court hearing on June 14, where a solidarity rally was to be held. 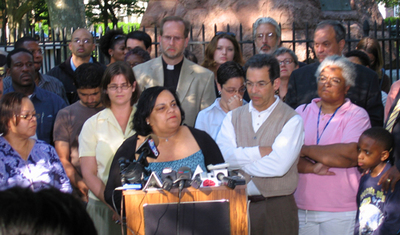 A coalition of unions, religious and community organizations is mobilizing for a statewide “March In Unity” through the streets of Fair Haven to the downtown Green on Saturday, June 16, to demand that all the detainees be freed and that the raids stop, and to uphold the city ID program, civil rights and amnesty for all.